Hundreds of medieval Greek manuscripts held by Cambridge and Heidelberg universities and the Vatican are to be made available to the public online. The £1.6m project will digitise more than 800 volumes featuring the works of Plato and Aristotle, among others. The manuscripts date from the early Christian period to the early modern era (about 1500 - 1700 AD). Cambridge University said the two-year project would open up "some of the most important manuscripts" to the world. Works set to be digitised include "classical texts and some of the most important treatises on religion, mathematics, history, drama and philosophy", a university spokesman said. The manuscripts are currently held at the university library, 12 of its colleges, the Fitzwilliam Museum in Cambridge, Heidelberg University Library in Germany and the Vatican Library in Rome. Bindings on many of the medieval manuscripts are in a fragile state and little is known about the identities of some of the scribes and artists involved in their creation. 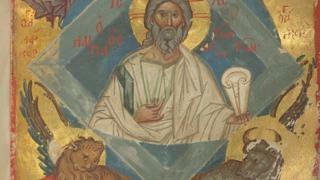 "Numerous discoveries await," said Dr Veit Probst, director of Heidelberg University Library. "[We] have yet to uncover how they were studied and used, both during the medieval period and in the centuries beyond." Dr Jessica Gardner, Cambridge University librarian, said the project would "[open] up some of the most important Greek medieval manuscripts to not just scholars, but the widest possible audience". Once digitised, the Cambridge manuscripts will join the works of Charles Darwin, Isaac Newton, Stephen Hawking and Alfred Lord Tennyson on the Cambridge Digital Library, which was started in 2010 with the digitisation of Newton's Principia Mathematica. The latest project is funded by the Polonsky Foundation, a UK charity which supports cultural heritage.